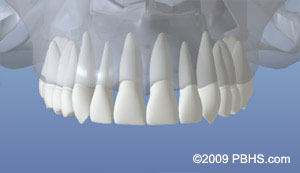 Our practice utilizes state of the art computer guided dental implant surgery utilizing Cone Beam CT (cat scan) technology. This technology provides our doctors with a highly accurate 3-D radiographic image for your dental implant surgery. For most patients, the placement of dental implants involves one surgical procedure. First, implants are placed in your jawbone. For the next 4 to 6 months following surgery, the implants are beneath the surface of your gums gradually bonding with the jawbone. During this same time, there is a temporary healing abutment which will be connected to the dental implant. This will slightly protrude through the surface of the gum tissue. You are most often able to wear temporary dentures or teeth and are able to eat a relatively normal diet during this time. After the implant has bonded to the jawbone, the second phase begins. Your general restorative dentist will now place the final tooth on your dental implant at this time. 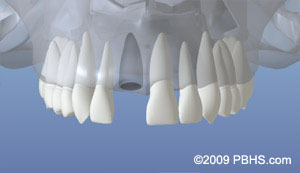 When the final teeth are placed, the implant within the bone is not seen. Most patients experience minimal disruption or pain during the entire surgical and restorative procedure. Now the healing begins. The length of time varies from person to person, depending upon the quality and quantity of bone. In some cases, implants may be restored immediately after they are placed. The surgeon will advise you on follow-up care and timing. After the implant is placed, it will require some undisturbed healing time to integrate into the bone. A temporary healing abutment of the exact same diameter and tissue height as the final natural profile abutment is placed. This abutment is removed when the final abutment and restoration are placed. Often times, if an implant is placed for one of the front teeth, you may prefer not to walk around without a tooth. Discuss temporary tooth replacement with both your dentist and oral surgeon for available options regarding immediate temporary tooth replacement.